The many and various Jew-hating outbursts by various members of Labour party, both rank and file and leaders, caused an impressive show of solidarity and protest by British Jews in London. 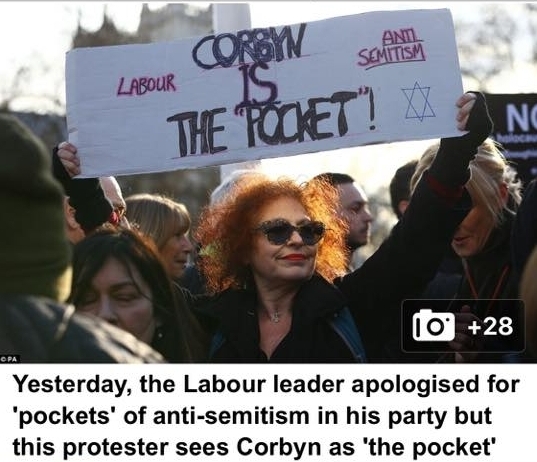 We recognise that anti-Semitism has occurred in pockets within the Labour Party, causing pain and hurt to our Jewish community in the Labour Party and the rest of the country. And in his letter to the Jewish leaders in reply to their open letter (both in the same link), Corbyn says all the right things. So what is the problem, you might ask? First of all, the valiant fighter for social justice, equality and peace has done nothing about anti-Semitism during his time at the head of the party. But there is another, more acute issue, and it is Mr Corbyn himself. The said spirit let itself to be invited (and joined) at least two virulently Jew-hating Facebook groups, spending several years in each one, without ever noticing the poisonous contents. The same spirit joined on its own another Facebook group of the same ilk and still continues to be a member there. Another honest mistake, you might say. After all, the group isn't titled anything like "Kill the Jew" or something in this vein. And, being a busy man, Mr Corbyn doesn't have time to really nitpick the small print. Right? The problem is that even on his own Facebook page our hero allows the racist vermin to proliferate and celebrate their verminity unopposed. And here is a selection of comments to be found on the said page, under the oh how politically correct response to the Jewish leaders, mentioned already here. Enjoy. Jeremy Corbyn is a member of two more virulently anti-Semitic Facebook groups, Guido can reveal, bringing the total up to five. Jezza has been a member of “Jeremy Corbyn Leads Us to VICTORY” since 2015. It is full of post after post about the Rothschilds, comparisons between Israel and the Nazis and “Antichrist Zionist Rothschild Jews”. “Jeremy i am a big fan huge one but no one is more racist faschist extremist and crying victims than jews”.